In this latest post, we’re bringing you 10 makeup looks for blue eyes. Each of these gorgeous makeup looks will simply make your stunning peepers pop – and what could be better than that? Champagne shades are a makeup bag must have. 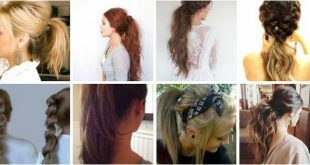 They’re so versatile and can create a range of gorgeous looks. 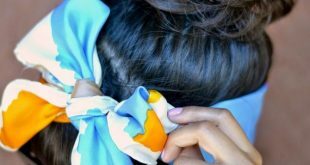 Especially if you have blue eyes, you’ll be reaching for this colour again and again. Recreate this look by sweeping a stunning champagne shade right across the eyelid. Take a light brown shade and blend throughout the crease and outwards. Drag the brown to the outer corner and drag it under the lower lash line too. Light to dark makeup blends show off your blue eyes more than ever! 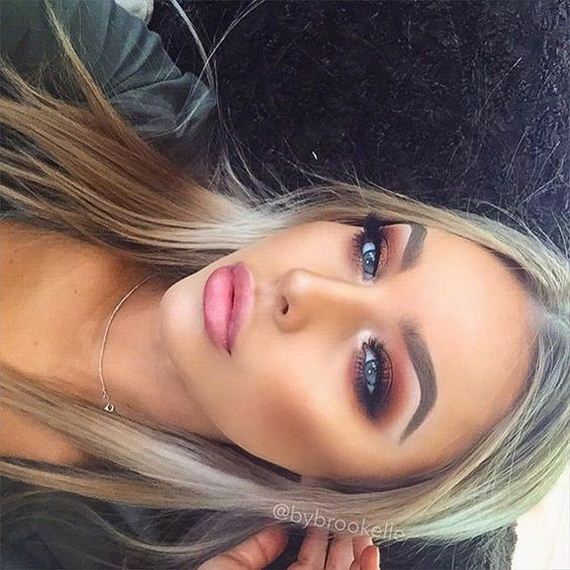 Recreate this look and you’ll be amazed at how much your eyes pop. Start with a pale and shimmery shade to the inner corner. 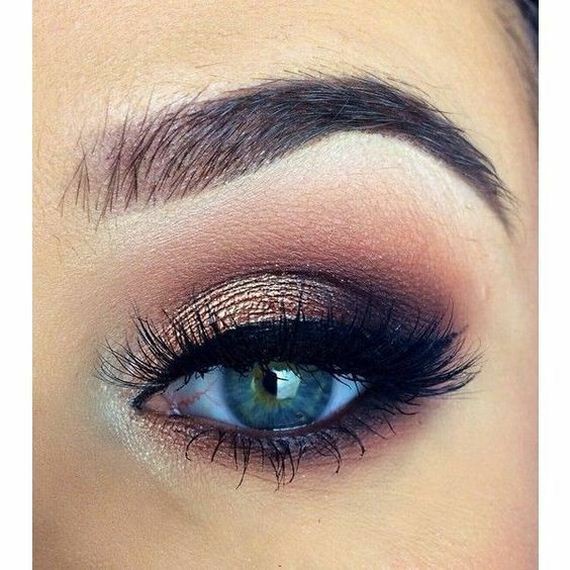 Take a brown and blend throughout the crease and outwards. Finish at the outer corners with a black shade and add lashings of mascara. Pale pink is a shade which compliments blue to perfection – don’t you agree? Start by taking a shimmery pink and paint across the eyelid. Use a light brown and gently add the shade to the outer corner of the eyelids, blending inwards towards the centre. 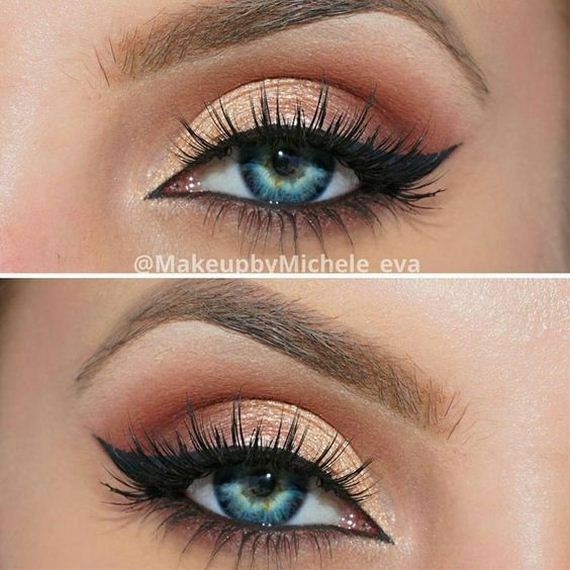 Add eyeliner and finish with plenty of mascara. 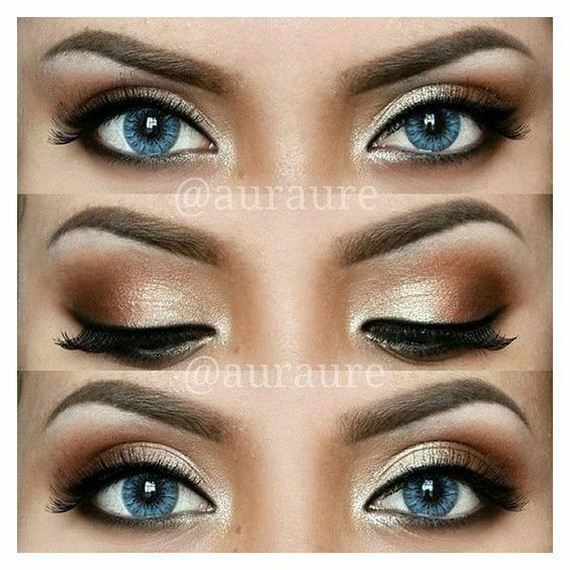 Gold and bronze tones blend together seamlessly, but also work exceptionally well with blue eyes. This striking bronze toned look has stolen the hearts of the Styles Weekly office! Start with a shimmery gold from the inner corner to the centre of the eyelid. Blend outwards to a smokey shade of bronze and finish with eyeliner. 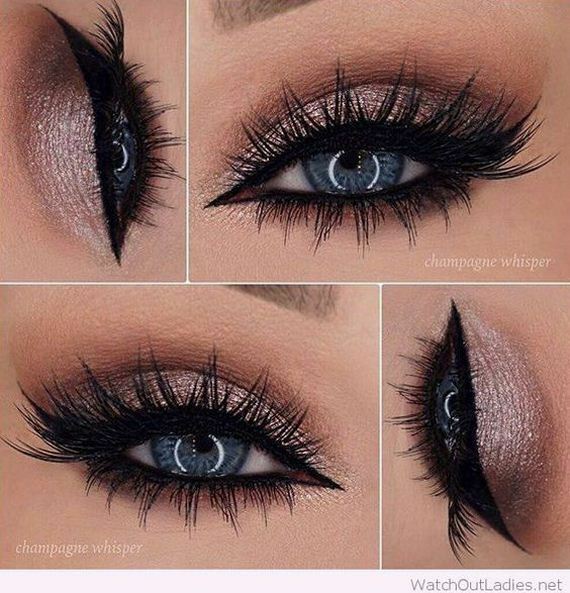 Smokey eye looks need not stick to brown and bronze shades to be effective. If you’re blessed with blue eyes then why not choose a pink and purple smokey eye look instead? Take a pretty pink and blend from the inner corner of the eye right out to the centre. With a dark purple, add to the outer corner and blend throughout the crease. 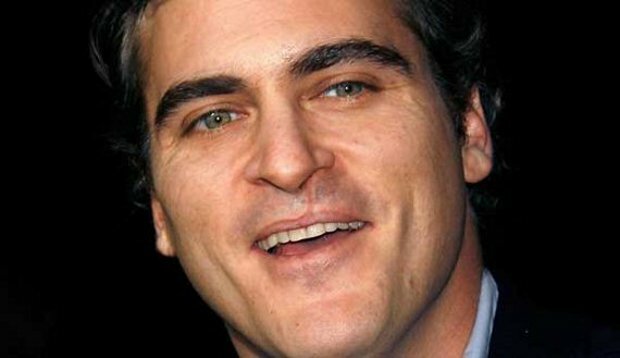 When you’re blessed with beautiful blue eyes, sometimes less means more. Your eyes are so bright and blue that you might not need a lot of eyeshadow! 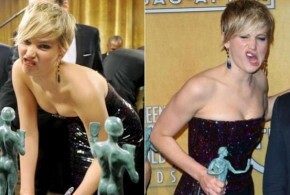 Copy this gorgeous lady with a simple and striking look. Choose a pale champagne shade and lightly sweep across the eyelid. 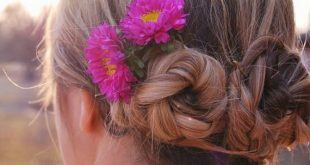 With a light brown, blend throughout the crease and outward. Terracotta hues work with blue eyes absolutely perfectly. Take a pale shimmery shade and add to the inner corner as a highlighter. Work with a light bronze and blend from the inner corner to the centre of the eye. Take a matte terracotta and blend throughout the crease and outwards. Add a dark brown to the outer corner to finish the look. Red smokey eye looks blend absolutely perfectly with blue eyes – so let’s recreate this look and show off your baby blues. Start with a matte shade of red and sweep all over the eyelid. Blend outwards through the crease and up towards the eyelid. Take a splash of champagne and add to the very inner corners. Finish with tons of mascara. You can never have enough brown eye shadows in your makeup bag – especially if you have blue eyes. 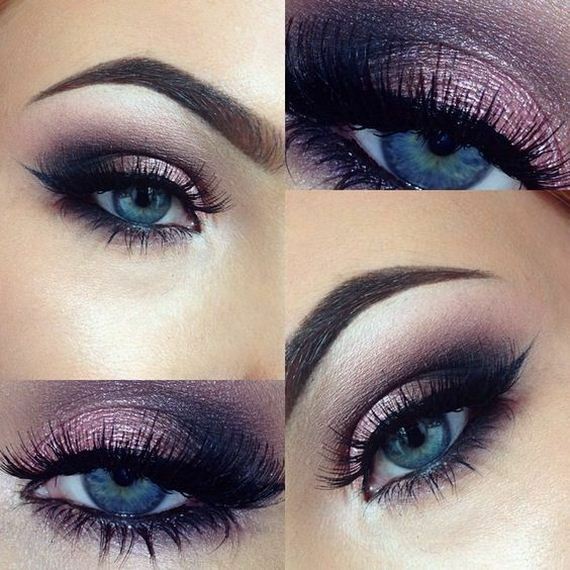 A simple smokey eye look can well and truly make your eyes pop. 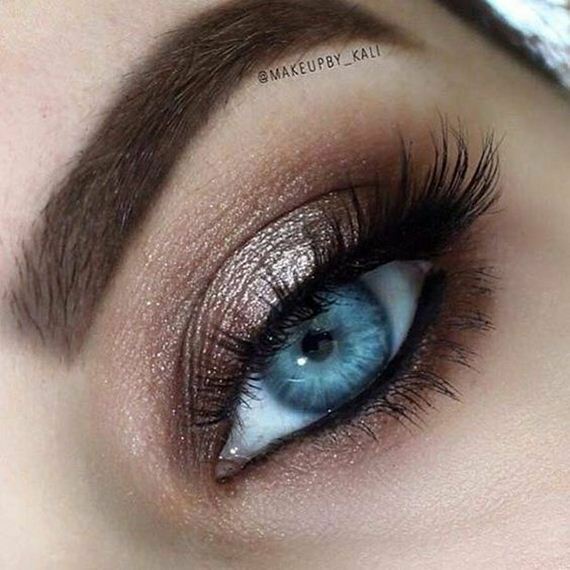 Start with a lighter shade of shimmery brown and blend all over the eyelid. Drag this colour under the lower lash line too. Finish with dark brown at the outer corners. Peachy hues match blue eyes perfectly. 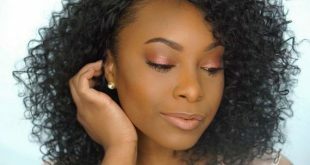 Whilst not your typical choice – one look at the picture above will show you why you need peach colours in your makeup looks. Blend a shimmery golden shade from the inner corner of the eye towards the centre. Using a peach shade blend throughout the crease and to the outer corners. Finish with eyeliner.